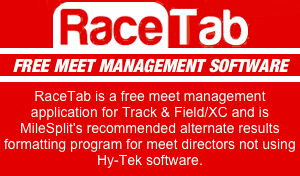 The MileSplit Database is a powerful tool in any competitive athlete's or coach's arsenal. We've harnessed that power to bring you the rankings for athletes in EVERY EVENT across EVERY GRADE level. Week in Review: The Regular Season is Over! The last weekend of the regular season has come and gone. It's that time again. The time when coaches begin to seed their athletes for sectionals and work really picks up for me. I have created the following video to help answer any questions you might have.